Today we’re announcing a new way of using prospect profiles in CharityCAN! Instead of just viewing our automatically created profiles, you can now save them to your own workspace for easy access for you and your team. Once a profile has been saved to your workspace, you can start adding donation records search results to it to give your team a verified view into their giving history. We’ve also added the ability to export any prospect profile, saved or otherwise, in a Microsoft Word document format, and improved the look of profiles when they’re printed directly from the website. This will let you get a headstart on your profile creation and make sure you’ll always have the most up-to-date information on a profile at your fingertips. This is just the start of our work on personal prospect profiles, so stay tuned for more announcements! To save a profile, first search for a name in our Prospect Profile or Integrated search. 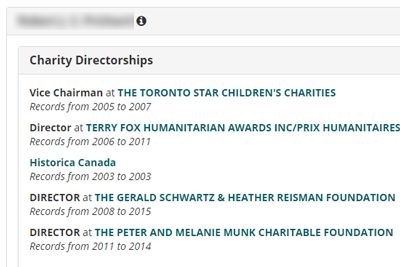 You can add a profile by using the “Save to profiles” button directly from the search results table, or click “View CharityCAN profile” for a closer look. 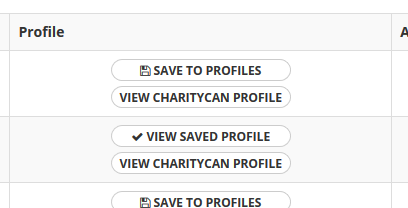 While viewing a CharityCAN-created profile, there will be another “Save to profiles” button that you can use. Once a profile has been saved, it will be available in My Prospect Profiles for anyone on your team to view. You can filter saved profiles on the My Prospect Profiles page by searching by name or city. You can append donation records to any saved profile anywhere you see donation record search results, either from Integrated search, the dedicated Donation Records search, or the results at the bottom of the profile itself. 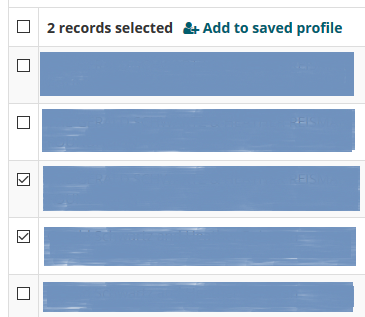 Select all the records you’d like to append and then click “Add to saved profile” at the top of the results table. Search for and select the profile you’d like to append the records to, and voila! You’ve now got verified donation records as a part of your saved profile. To export a profile as a Word document, just click “Export” at the top of any profile page. You’ll get most of the profile details in a format that can be easily saved or modified offline. We hope you find this new feature useful! If there’s more you’d like to see, or if you’d like a tutorial, please contact us. If you’re new to CharityCAN and want to see how these profiles can help your major gift pipeline, sign up for a free trial!